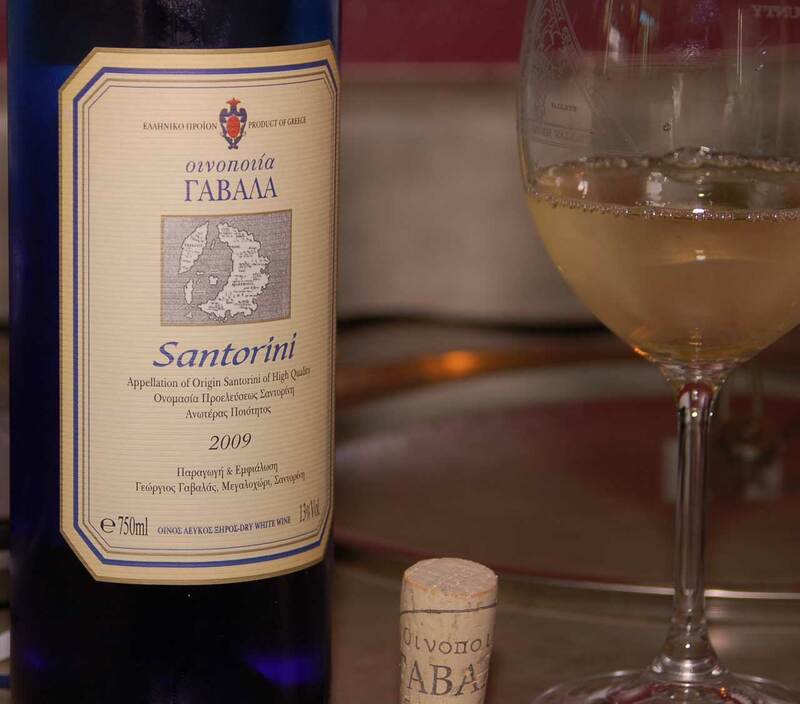 In a quest to achieve my wine century club membership, I have come across a Greek wine varietal, Assyrtiko. I paired this wine up recently with another of my “Not Bad” dinners and was pleasantly surprised with how things turned out. Now on with the wine! The Nose: Lemons, grass, and wet stone backed up by a slight hint of apples. The Taste: Crisp and refreshing green apple, lemon zest and chalk, It really tastes like champagne without all of the bubbles! 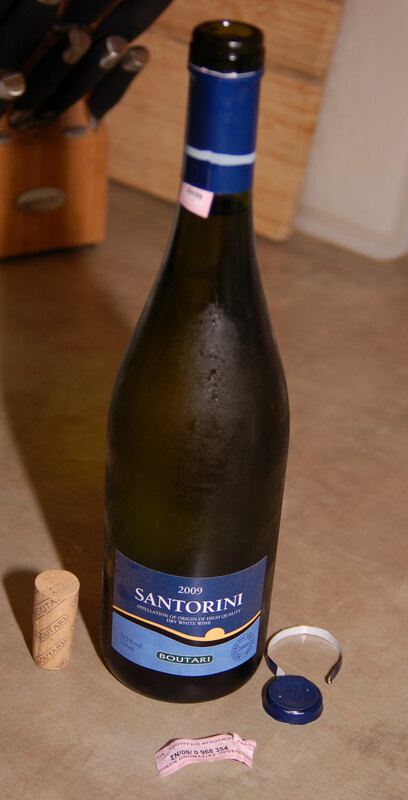 The Mouth Feel: Light and wispy, a hint of effervescence super long finish like mineral water. This wine is refreshing, a definite summer-sipper. The Color: Pale yellow to white. The Verdict: This wine is really nice, the tart fruit and acidity make for an exceptionally long and enjoyable finish. 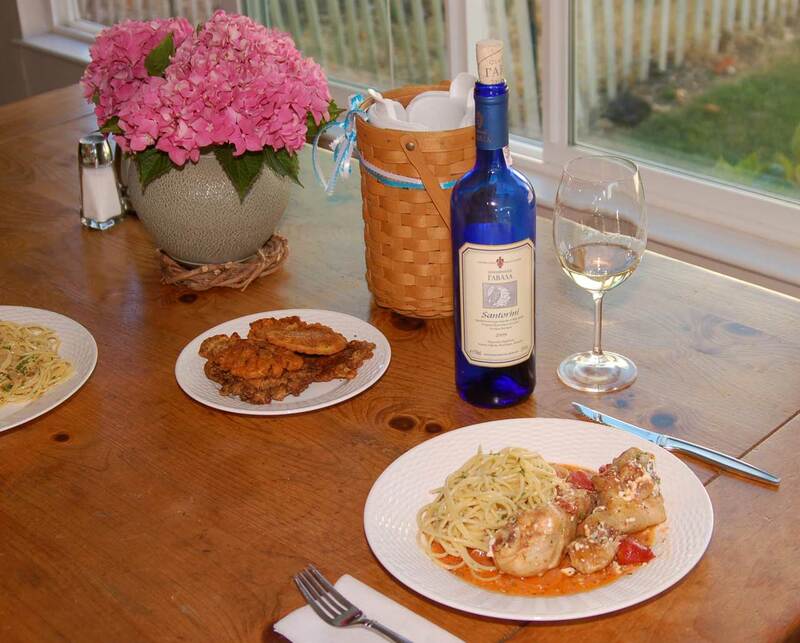 This wine paired perfectly with my tomato and chicken dish from the last “Not Bad.” According to the bottle it would also do well with fish or other white meat dishes. I’d have to agree. 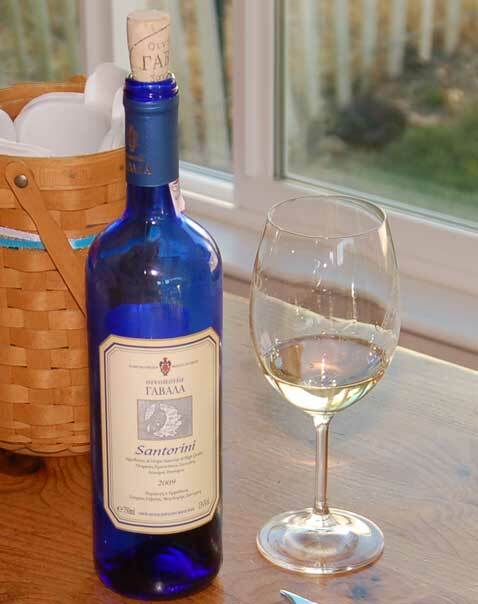 Add two varietals to my checklist on my century journey, but the trouble now is I have yet another great white wine to go to on a hot summer day. Ah to have troubles like this all of the time! In Vino Veritas: This wine was provided as a professional sample with the intention of review. In my continuing new endeavor of joining that elite group, the Wine Century Club, I have been buying up and begging for varietals that I’ve never had before. After checking out Joe Herrig’s (Suburbanwino) post about fighting sea monsters with which he paired up an Assyrtiko, it got me thinking that I should do my own Greek themed dinner. I don’t have the latitude to cook up any old thing since the wife just doesn’t do fish, so there was a snowball’s chance in hell that I could get away with a seafood dish. Anyhow, after a little research I found a nice chicken dish and paired up with a pasta with a little puffed cheese and egg appetizer. Place feta in water and set aside. Heat 1 tablespoon of oil in skillet and brown chicken pieces. Transfer chicken to a platter. 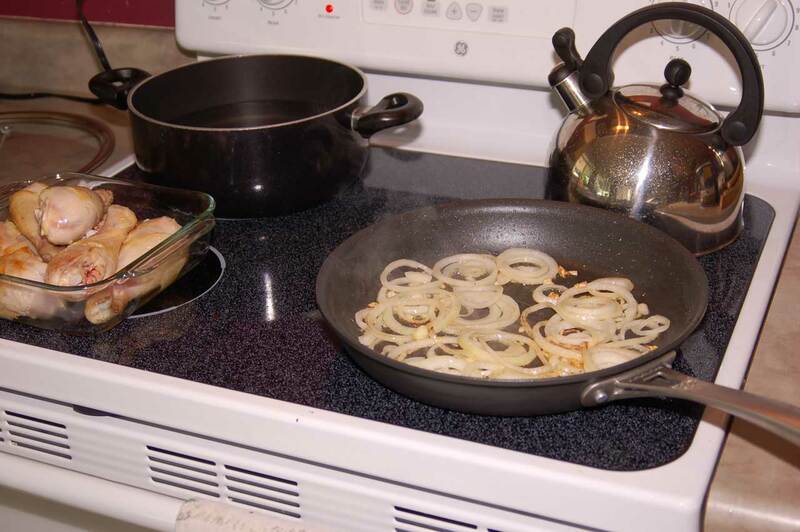 Add the teaspoon of oil to the pan along with the sliced onions. Cook over low heat for 10 minutes. Add garlic and cook for another 5 minutes or until onions start to brown. Add the chopped tomatoes and liquid, oregano and pepper. 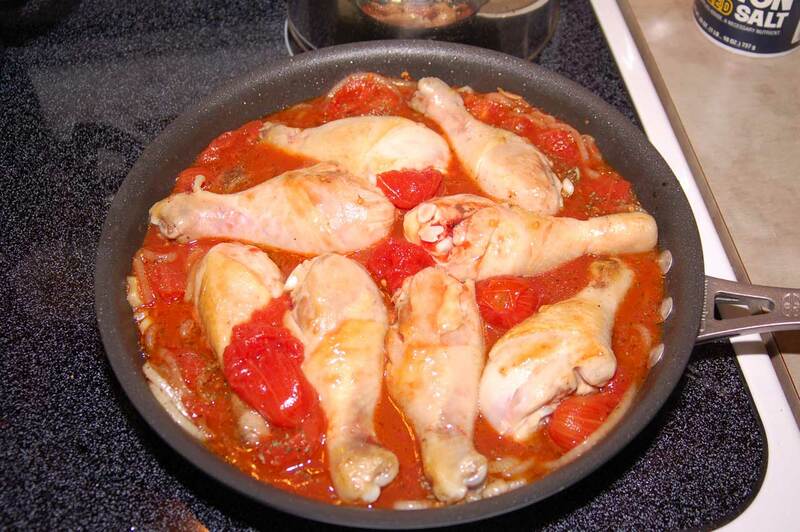 Place chicken pieces on the sauce. Cover and bring to a boil. Reduce to a simmer and cook 40 minutes. 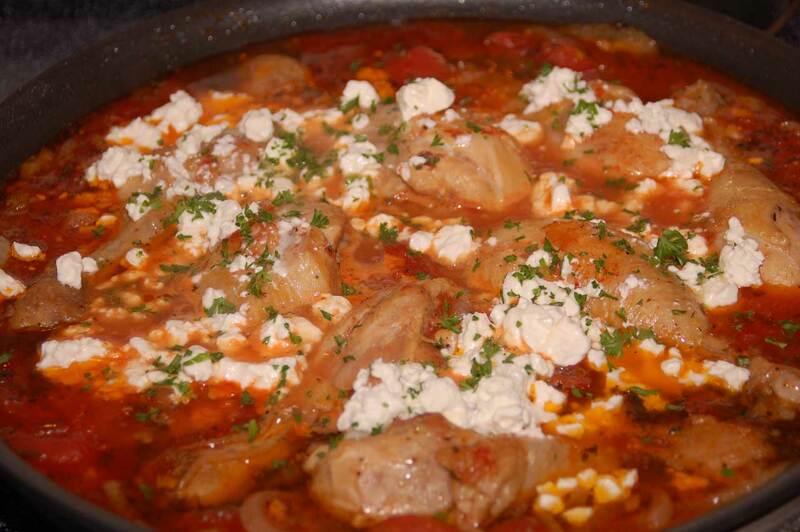 Remove feta from water and arrange on top of chicken. So the pasta dish is pretty basic, just spaghetti with some butter and shredded Romano. The recipe calls for a Greek cheese named Kefalotyri, however I couldn’t track any down but I checked in at the local Oliver’s Market which has an on staff Cheese Master, I’m not sure what her title is but she knows cheese like a Sommelier knows Wine, she did some research and found out that it is similar in taste and nature to Romano, but is less salty, nonetheless, I used some Romano. Fill a large deep pot 3/4 full with water. Add salt and bring to a rolling boil. Add pasta slowly, without breaking the boil. Cook 10 minutes. Place a colander in sink and turn pasta into it. Rinse under hot running water, allowing the water to drain through the spaghetti. 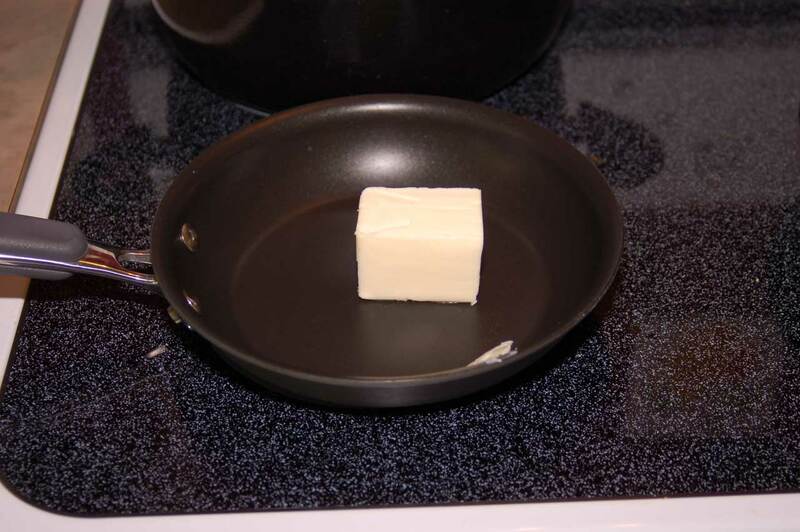 Heat the butter in a small saucepan to a honey brown. Watch it carefully for these minutes; it burns quickly and suddenly. Return spaghetti to large pot and dribble hot butter over it. Sprinkle with half the cheese and toss gently to mix. Transfer to a large ovenproof platter, sprinkle top with more cheese and bake for 10 minutes at 350 F. Serve hot. Here’s where I tried something that is way out of the norm. This didn’t really turn out all that great, but it sounded good so it was worth a try. I’m not sure what is missing or what but I think perhaps some more flour might actually help it a bit. Regardless, here’s the recipe I used. Beat eggs well; add flour sifted with baking powder and salt. Add parsley and cubed cheese. Mix together well. Brown in butter in frying pan, and drop in the batter, a spoonful at a time, to fry. Keep the heat regulated so puffs do not burn. When they are lightly brown, turn carefully, with slotted spoon, without peiercing, and drain on absorbent paper. Serve hot. I received a sample of wines from Santorini, and paired this dinner with ΓABAΛA from Santorini (I have no idea how to say what the name of the wine is, it’s Greek to me, I think it’s pronounced Gah-vah-las). Regardless of how to pronounce the name all you need to know is that it is a great match and really tasty. Look for a review soon!